It’s really interesting to me that the games we play on our iPhones and computers often revolve around jobs that we’d never want in real life. How many of us have played Farmville or Diner Dash to pass the time…and how many more of us would absolutely hate to work on a farm or in a diner in real life? 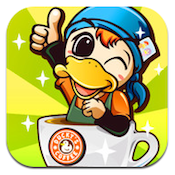 Ducky’s Coffee, developed by Little Robot Studio, is an addictive little game where you run your very own coffee shop. You play as, surprise, a cute little duck who is just trying to earn enough money with his coffee shop empire to win the hand of his beloved lady duck. Make enough cash selling cups of Joe, and the lady duck’s father will consent to your marriage. The mechanics of Ducky’s Coffee are pretty simple: tap on an item in your drink-making arsenal to start making a coffee or tea, then tap the customer to deliver their beverage. You’ll start out making hot coffee and tea, then move on to iced drinks and eventually even make smoothies. 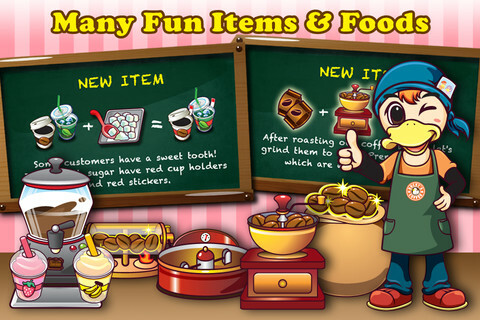 Each menu item has its own special cup and ingredients: use the wrong ingredients or container, and you’ll have unhappy duck customers on your hands. There’s a story mode, which has great comic book cutscenes, as well as a Blitz Mode, where you need to serve an onslaught of thirsty customers. 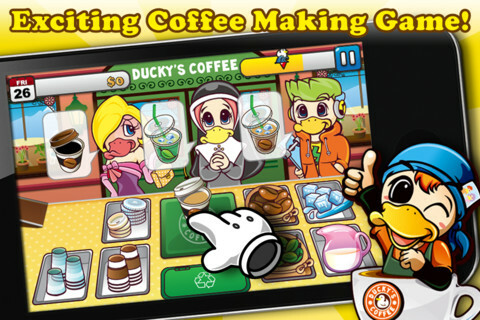 Blitz Mode is great for testing your speed and accuracy, while Story Mode is a more engaging side of Ducky’s Coffee. If you love iPhone games that challenge your mind and your dexterity at the same time, keeping up with the grueling mental and physical pace of Ducky’s Coffee is a challenge you’re sure to love. 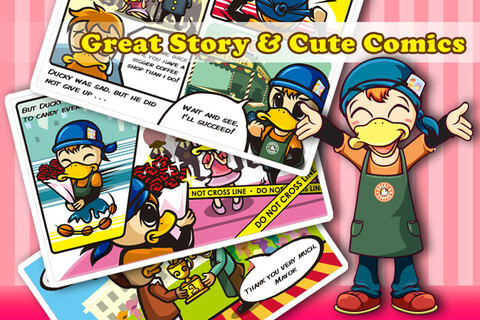 Whether you gravitate towards simulation titles or not, Ducky’s Coffee for iPhone is worth checking out. Ducky’s Coffeeis compatible with iPhone, iPod touch, and iPad. Requires iOS 4.0 or later.